For TIST to remain successful, local staff work with international partners, assuring that the program is locally responsive and broadly accountable. Staff adhere to strict standards for reporting on program finances and activities, and do so in the context of continually expanding and improving upon the program. Rigorous accounting of program finances assures stakeholders of the viability of the program. Accounts are reviewed internally and audited externally on a regular basis. Program staff report out on significant activities and events around the world, so that stakeholders around the world may remain abreast of important developments. The project builds on local infrastructure by developing exisitng personnel to manage small group training, small group recruitment, systems implementation, and program management. In Tanzania the churches and their associated administrative structures are among the strongest social units. 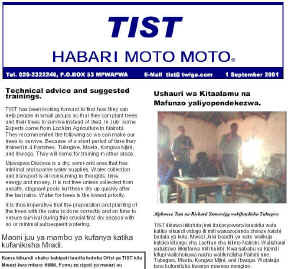 Communication and training on best practices to small group members occurs in part through a monthly newsletter, named in Tanzania the Habari Moto Moto (Hot Hot News). Rigorous financial reporting maintains accountability, while planning for replication helps identify lessons for the future. Local leadership also help plan for the project to be replicated in other locations. Best practices for the project are documented locally to assist in efficient replications of the program in other sites. TIST is committed to replication of the program in other sites in Africa , including small group development, program development consultation, and implementation oversight. TIST is always seeking new partners to support new phases of the program or to underwrite specific components of the program.